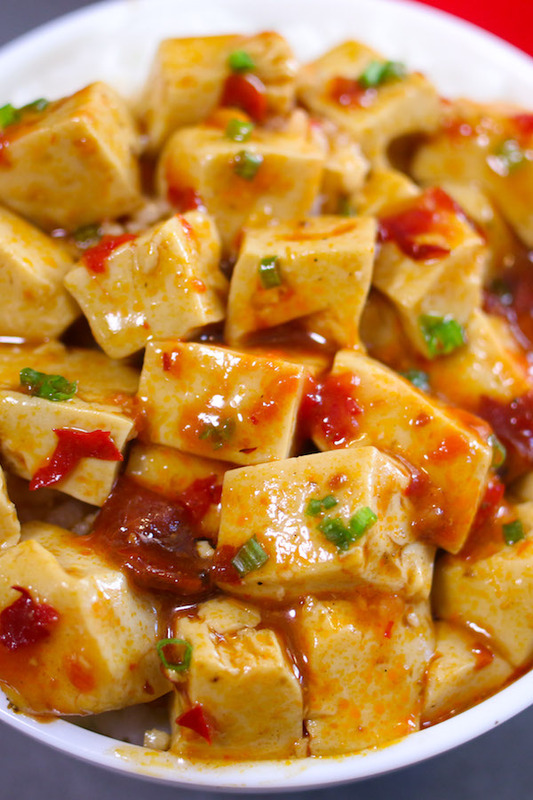 Mapo Tofu (麻婆豆腐) is a classic Szechuan dishes featuring silky texture and complex fiery flavors. Serve this authentic Chinese dish by itself or on top of steamed rice for delicious meal everyone will love! 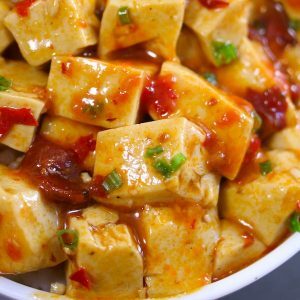 I discovered this mapo tofu recipe while living in China, and it’s been one of my all-time favorite dishes ever since along with Szechuan Chicken. 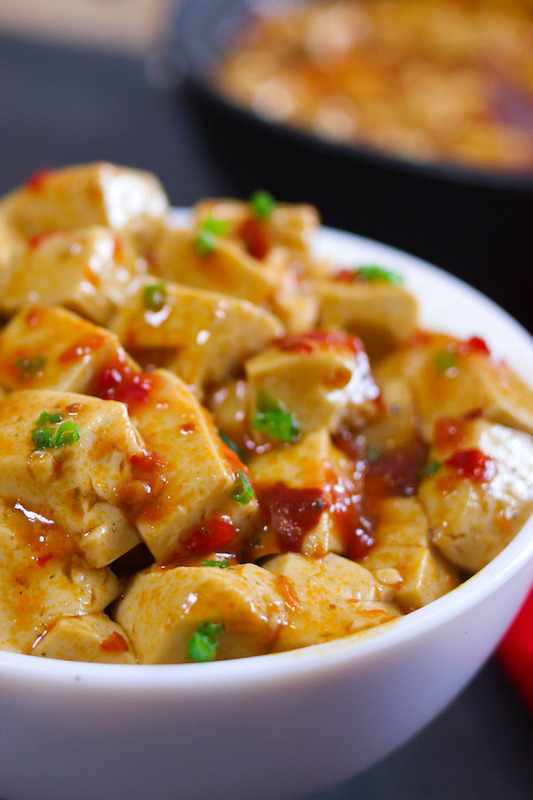 The combination of tofu and meat in a spicy sauce just hits the spot, and you can easily adjust the ingredients to suit your taste. 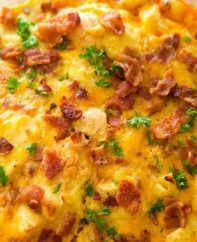 You can serve it as a main dish or with sides like rice and bok choy. 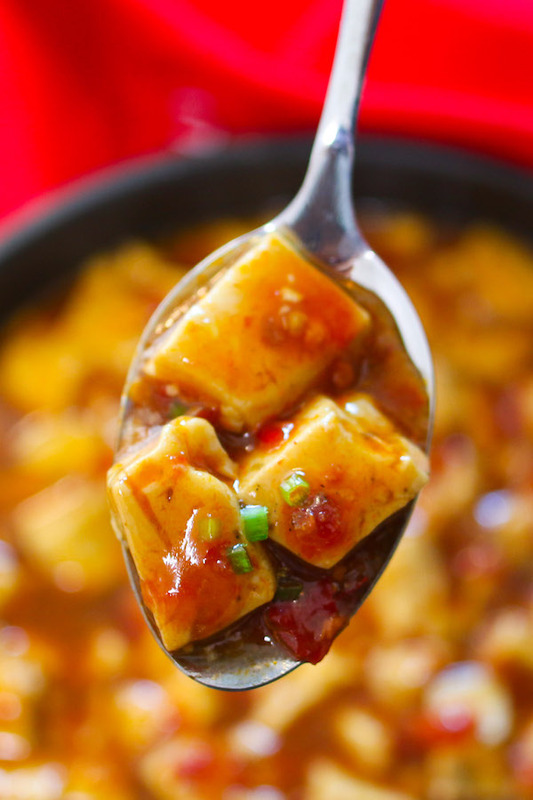 The name mapo tofu translates as pockmarked woman’s tofu, and legend has it she was the wife of a restaurant owner in Chengdu, the capital of China’s Sichuan province. Since then it’s graced dinner menus at Chinese restaurants across Asia and America. The dish consists of tofu cubes simmered in an aromatic sauce with ground meat, garlic, ginger, chilies, soy sauce and a fermented broad bean paste called doubanjiang (豆瓣酱). Before serving, it’s garnished with toasted ground Szechuan peppercorns, a splash of toasted sesame oil and green onions to make some of the most tender and soothing comfort food ever! If you’re struggling to get the four Asian ingredients, the easiest option is often to simply order online. You can skip some or all of them and still get a tasty dish, although it won’t be as authentic. Substitute ground turkey or chicken for ground pork to make a leaner meal. Substitute minced mushrooms instead of meat to make a vegan meal. Try using firm or extra firm tofu instead of soft tofu. 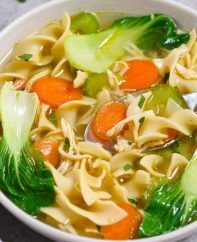 Although non-traditional, you can add onions or vegetables like bok choy. 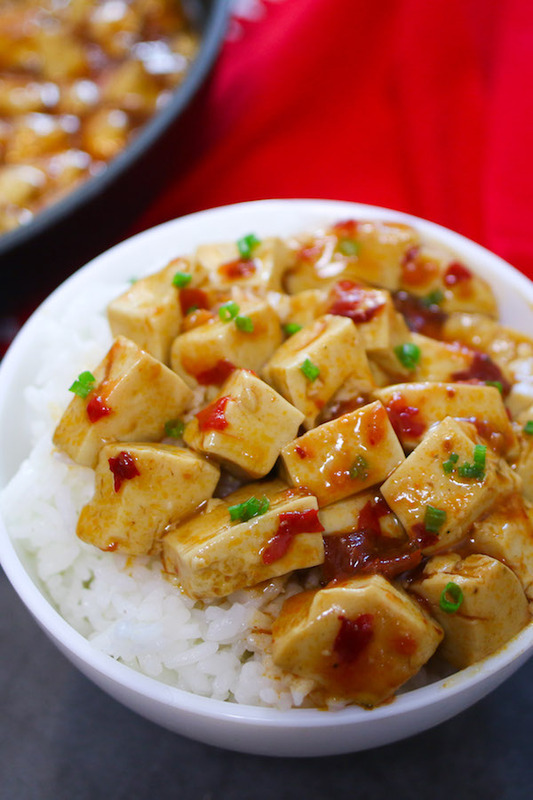 Mapo tofu is a delicious make-ahead dish with flavors improving overnight. 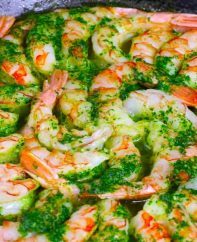 Simply store in an airtight container in the fridge for up to 3 days. If you can’t find szechuan peppercorns, you can try substituting crushed coriander seeds or put white peppercorns into a pepper mill and grind some onto the map tofu. Place a large skillet over medium-high heat and add the vegetable oil followed by the ground pork. Stir for several minutes until lightly browned. Add the garlic, ginger, dried red chilis, doubanjiang and black beans. Saute for about 30 seconds until fragrant before adding in the soy sauce and water/broth. Gently slide the tofu into the pan. Avoid stirring right away to minimize breakage of the pieces. Bring to a boil and reduce heat to medium-low. Simmer 10 minutes. Mix the cornstarch with the water in a cup and pour over the tofu. Stir gently for a minute or two until thickened slightly, and remove from heat. Crush the Szechuan peppercorns with a mallet/rolling pin, mortar & pestle or coffee grinder. Dry fry over medium heat for 1 minute until toasted slightly. Add the toasted peppercorns, sesame oil and green onions to the tofu. Serve over steamed rice or by itself. Enjoy! You can use ground beef, chicken or turkey if you prefer instead of ground pork. For a vegetarian option, use minced mushrooms. Don't overstir the tofu to avoid it breaking apart. Asian sesame oil is made with toasted sesame seeds and imparts a delicate nutty flavor to the dish. Omit the chilis/chili oil if you want a less spicy dish.